an urban retreat in the heart of downtown welcome to the Hampton Inn - Suites Chattanooga/Downtown TN Boasting a fabulous central location the Hampton Inn - Suites Chattanooga hotel is within blocks of Riverfront attractions and just a 20-minute drive from Chattanooga Municipal Airport. After arriving relax and unwind in the courtyard under the Chattanooga sky or enjoy a stroll along the Tennessee River to historic Bluff View Art District and the Walnut Street Bridge the world*s longest pedestrian bridge connecting downtown to the eclectic North Shore and Coolidge Park. Also close to our Chattanooga TN hotel is the Tennessee Aquarium an IMAX 3D Theater museums shops and more. You*ll find it easy to get around since we*re steps from the downtown shuttle. If you*re here on business you*ll be mere moments from the Chattanooga Convention Center as well as corporate offices like BlueCross BlueShield of Tennessee Volkswagen of America Erlanger Health System Tennessee Valley Authority Unum Group Alstom Power and the University of Tennessee at Chattanooga just to name a few. 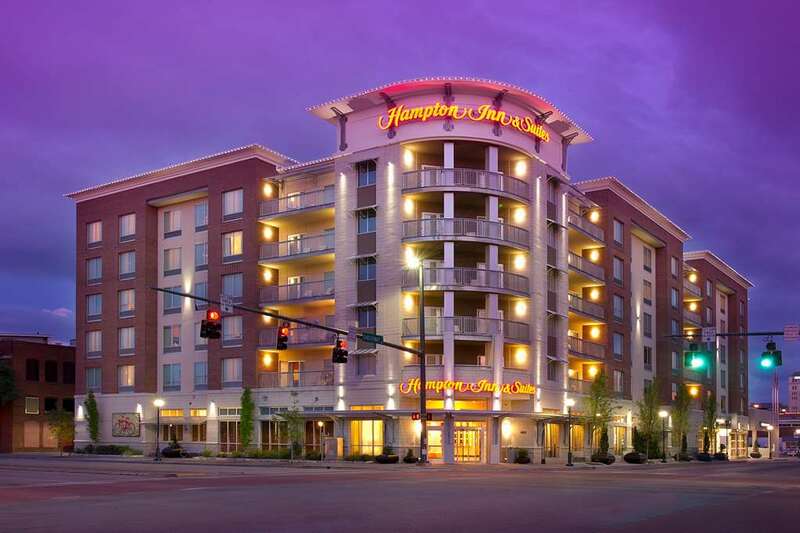 We invite you to stay at the Hampton Inn - Suites hotel in Chattanooga an urban retreat in the heart of downtown. Eleven: Eleven is located across the street at the Doubletree Hotel Chattanooga Downtown - Inspired traditional Dining modern urban setting featuring continental cuisine.